DARPA has announced the first set of teams participating in the Urban Challenge of 2007. This will be the third DARPA Grand Challenge for autonomous vehicles. 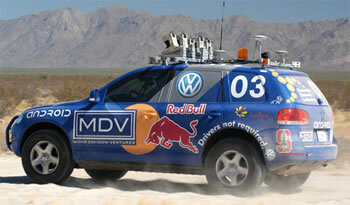 In the 2005 Grand Challenge, "Stanley" the robotic Volkswagen Touareg of the Stanford University racing team completed the 132 mile race with a winning time of just 6 hours and fifty-four minutes. Four other vehicles succeeded in finishing as well. Heartened by these results, DARPA issued an even more difficult test of autonomous vehicle excellence - the Urban Challenge consisting four sets of vehicle behavior requirements. First, the vehicle must be in autonomous mode and ready to begin its run less than 5 minutes after receipt of the Mission Data File (MDF) from DARPA. This insures that there is no human inspection of the data. Second, the vehicle must follow MDF checkpoints, but may start at any point in the route network. Each start chute will be a road segment in the test. Third, the vehicle front bumper must pass over each checkpoint in the MDF in the correct lane or spot and in the correct sequence. Finally, the vehicle must remain entirely in the travel lane at all times except when performing a legal traffic maneuver such as a left turn or maneuvering to avoid an obstacle. Vehicles may leave the travel lane under certain circumstances; for example, the vehicle may pass a stopped vehicle. Also, DARPA will enforce a minimum speed limit to ensure good traffic flow. A maximum speed limit must also be observed. Vehicles are prohibited from lengthy "stop and stare" delays of more than ten seconds. However, the vehicles must act to avoid collisions and near-collisions at all times. If you think that DARPA has been listening to your old driver's ed instructor, you're right. Vehicles must also maintain a minimum forward vehicle separation of one vehicle length for each ten miles/hour of speed. The full requirements for advanced navigation and traffic awareness are rigorous; vehicles must even be capable of executing U-turns when faced with roadblocks. Read more about the rules for the DARPA Urban Challenge; you can get started with the DARPA Urban Challenge Technical Evaluation Criteria (pdf).